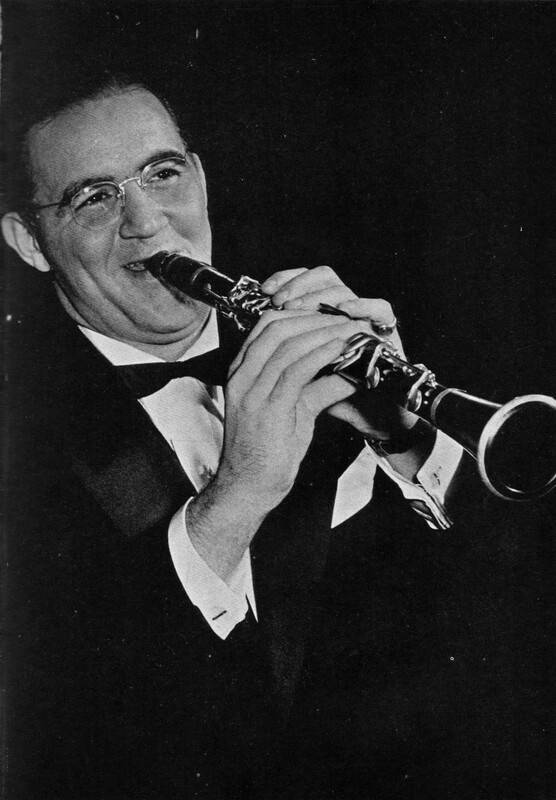 Benny Goodman, as pictured in Esquire’s Jazz Book, 1944. The first birthday ever celebrated on Old Time Blues was the legendary Benny Goodman’s. Now the time has come around once again to pay tribute to one of the most important musical figures of the twentieth century, and one of my own favorites, the one and only King of Swing. Benjamin David Goodman was born on May 30, 1909, the ninth of twelve children of David and Dora Goodman, a family of poor Jewish immigrants in Chicago, Illinois, a pivotal location in the development of jazz. Goodman’s father took him to free concerts on the weekends, and enrolled him in twenty-five cent music lessons at the local synagogue. He later took clarinet lessons under a classically trained professional. Benny soon joined the boy’s club band at the Hull House. He first played professionally in 1921, and joined Ben Pollack’s Orchestra at the age of sixteen, with whom he made his first commercial recordings in 1926. In 1928, Goodman made his first records under his own name for Vocalion and Brunswick as “Bennie Goodman’s Boys”. By that time, he had already recorded quite extensively, and continued to work prolifically as a studio musician until forming his own orchestra. After making a series of dance band recordings for Brunswick’s Melotone label in 1930 and ’31, and one date with Columbia the same year, Goodman, with the help of John Hammond, who arranged for a series of sessions for Columbia, put together the first incarnation of the band that would make him famous in 1933. With Jack Teagarden, Gene Krupa, and others in-and-out, Goodman’s new band played swing. In June of 1934, Goodman and his orchestra opened at Billy Rose’s new Music Hall at 52nd and Broadway, and secured a spot on the NBC radio show Let’s Dance. With need to expand his repertoire as a result of his newfound success, Goodman began purchasing sophisticated arrangements from Fletcher Henderson. In 1935, Goodman’s orchestra switched from the failing Columbia to Victor Records, which soon produced a hit with “King Porter Stomp”. On August 21, 1935, Benny Goodman’s orchestra kicked off the swing era with a famous engagement at the Palomar Ballroom in Los Angeles, California. In 1937, Goodman and his orchestra appeared in The Big Broadcast of 1937 and Hollywood Hotel. As Goodman’s popularity continued to soar, Goodman earned the distinction of leading the first jazz ensemble to play at Carnegie Hall, at his legendary concert on January 16, 1938. In addition to his orchestra, Goodman also led small groups, his famous Trios, Quartets, and Sextets. Goodman refuted segregation, employing the likes of Charlie Christian, Lionel Hampton, and Teddy Wilson, once stating, “If a guy’s got it, let him give it. I’m selling music, not prejudice.” At various points, his band employed the enticing vocals of Helen Ward, Martha Tilton, and Peggy Lee, among many others. In 1939, he left Victor to return to Columbia, which had been purchased and revived by CBS, with his band appearing on first issue of the revived label. His success did not falter through the end of the swing era in the middle of the 1940s. Even after swing had swung, Goodman was still in demand as a revered jazz musician. In 1947, he switched labels once again, to Johnny Mercer’s Capitol Records. He made forays into bebop, cool jazz, and classical music. Benny Goodman continued to play until his death from a heart attack on June 13, 1986. Columbia 2958-D was recorded on August 16, 1934 in New York City. In the band are Russ Case, Jerry Neary, and Sam Shapiro on trumpets, Red Ballard and Jack Lacey on trombone, Benny Goodman on clarinet, Hymie Schertzer and Ben Kantor on alto sax, Arthur Rollini on tenor sax, Claude Thornhill on piano, George Van Eps on guitar, Hank Wayland on string bass, and Sammy Weiss on drums. As indicated by the “Music Hall” appellation, this record dates to Goodman’s stretch at Billy Rose’s Music Hall. First up is Benny Goodman’s amazingly energetic first recording of “Bugle Call Rag”, most certainly my favorite recording of the standard. Goodman recorded another notable version for Victor in 1936, and it remained a staple of his repertoire. 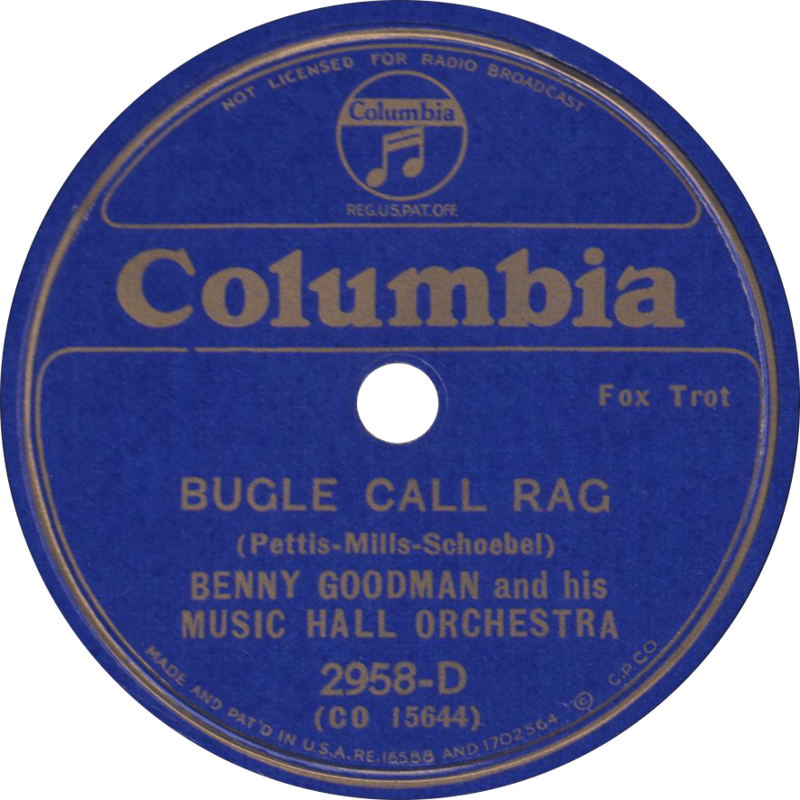 Bugle Call Rag, recorded August 16, 1934 by Benny Goodman and his Music Hall Orchestra. On the other side, Will Hudson’s “Nitwit Serenade” borrows a famous part from the Armstrong–Oliver jazz standard “Dipper Mouth Blues”. 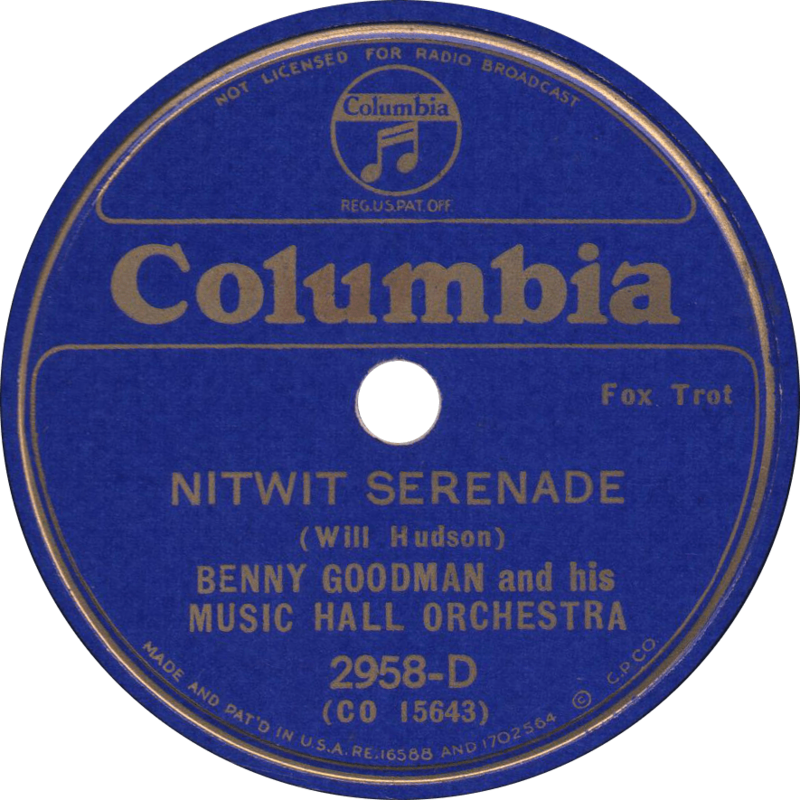 Nitwit Serenade, recorded August 16, 1934 by Benny Goodman and his Music Hall Orchestra. This entry was posted in Records and tagged 1930s, 1934, Arthur Rollini, Ben Kantor, Benny Goodman, Claude Thornhill, Columbia, George Van Eps, Hank Wayland, Hymie Schertzer, Jack Lacey, Jazz, Jerry Neary, New York, Red Ballard, Russ Case, Sam Shapiro, Sammy Weiss, Swing by R. Connor Montgomery. Bookmark the permalink. Excellent tribute to the wonderful Benny Goodman!